I have been wanting to make a cute Easter Cricut project for our home. I decided to make this adorable Easter Bunny banner out of felt. I have to admit that it is one of my favorite Cricut projects that I have made in a while! I’m not sure that I would include this in the easy Cricut projects category because of the hand stitching, but if you hot glued the edges instead of hand stitching them you could definitely speed up the process. Either way, I think the result it totally worth it! DMC floss in 208 (very dark lavender), 307 (lemon), 964 (light sea green), 3806 (cyclamen). Twine to hang the bunnies on. I bought a ball of two colored twine from Michales and it was only a dollar! Next, upload the SVG to Cricut Design Space. It is set up to cut four bunnies from each 9”x12” sheet of felt, which is enough to make two bunnies. Using the Cricut Maker makes cutting the felt for this project super easy. Lay the felt on the pink fabric mat in the top left corner so it is taller than wide. Make sure you rub it down well so the mat has a good grip on it and it is smooth with no wrinkles. On the materials screen before you cut, search ‘felt’ and then select ‘felt, wool fabric’. The rotary blade cuts through the felt like butter! If you do not have a Cricut Maker and are using a Cricut Explore, you will need to bond the felt first with Heat N Bond. When you go to cut, select the ‘felt, wool bonded’ option. Need a “cutting felt with the Cricut” refresher? I wrote a post all about cutting felt with the Cricut Explore and Cricut Maker here. You will end up with four cuts of each color (16 pieces). Once sewn together it will make eight bunnies for our banner. Here comes the fun part! I actually enjoy hand stitching, but if you do not, you can always use a hot glue gun instead. I would suggest a fine point one so that you can have some precision in where you place the glue. I divided the DMC floss into two strands for this project. 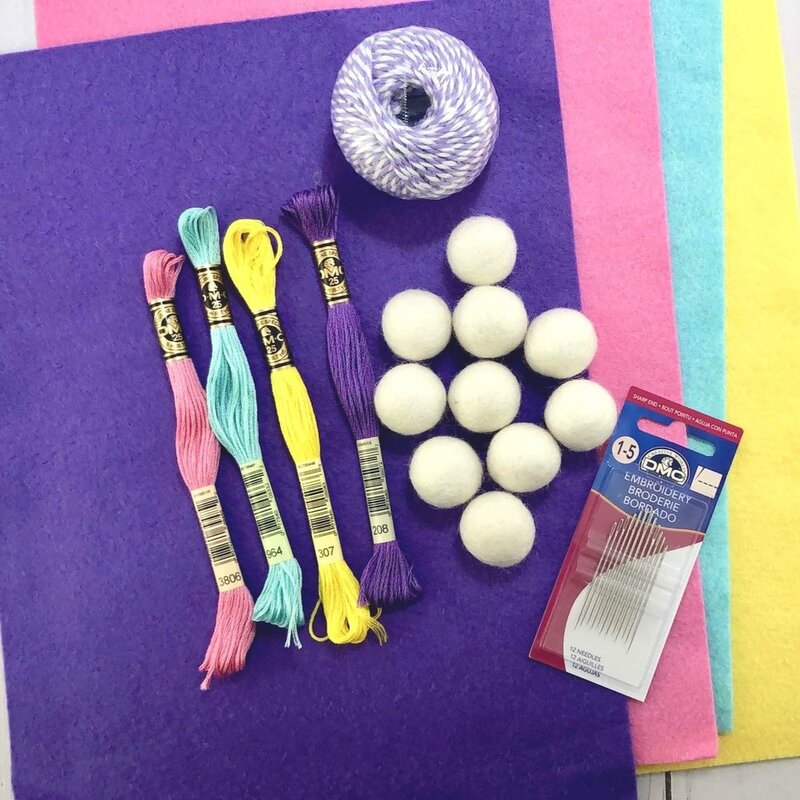 If you want the stitches to be more obvious, you can use as many strands as you would like. A word of caution: be very careful where the body and head meet. The rotary blade cuts in a bit farther than the point. Make sure you make a stitch right where the point comes in, even if it throws your spacing off a little. Put your needle in a tad bit further than you normally would to make sure the stitch will hold well. The first one I made I sewed all around except for a gap at the bottom. It was really hard to stuff the ears with the Polyfill! I found it was much easier to start on one side of the head and sew to the other side, then stuff the ears. You will also need something skinny and long to help push the stuffing into the ears. I’m sure they have a tool for it, but my pen worked just fine. Sew some more and stuff as you go until you have stuffed and sewn completely around the bunny. Be mindful of how much you are stuffing. I noticed that after I was done some of my bunnies were more plump than others. Look at each side of the stuffed bunnies and see if there is a side that looks better than the other. Whichever side you prefer will get a good size glob of hot glue and the felt ball on its booty. To assemble the banner I cut two slits on the back side of each bunny, just slightly under each ear. If your twine is not as thick as mine and is more like string, you can most likely skip this step. The twine I used was thick since it was two colors and it wouldn’t push through the felt on its own. After cutting the slits I slid the embroidery needle through from left to right. 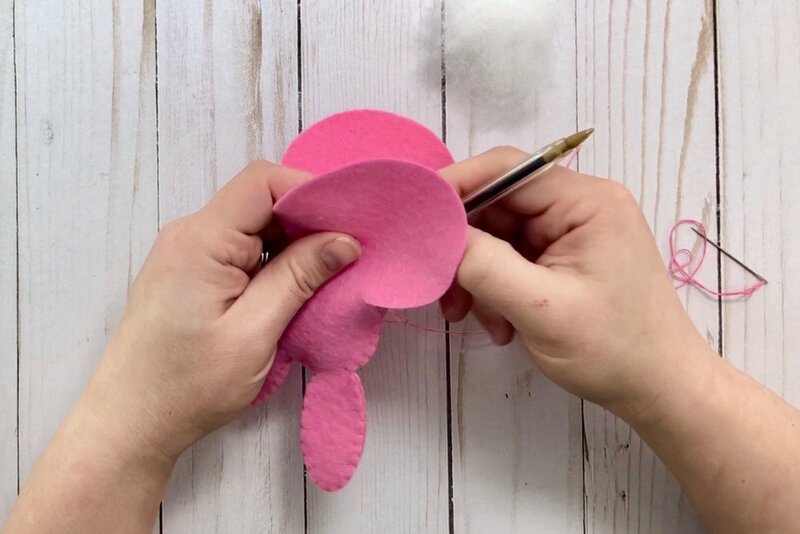 Make sure you try to keep the needle as close as you can to the top layer of felt to keep from catching a lot of stuffing. If some of the Polyfill comes out it is fine though. Just pull it off and keep going. I like that the bunnies aren’t actually fixed on the twine. It allows you to slide them and adjust the spacing based on where you decide to hang it. I hung it on my mantle, but you can hang your Cricut felt Easter Bunny banner anywhere! If you make this Easter Bunny banner with your Cricut, please share a photo in our Facebook group or email me at admin@CreativeCuttingClassroom.com. I’d love to share your project! Get instant access to the bunny banner SVG file by signing up below. 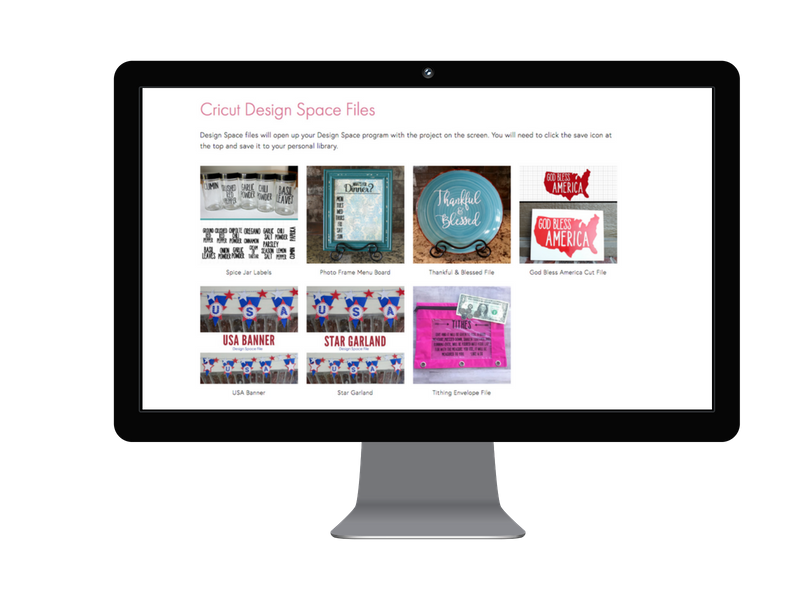 Subscribe for free to my newsletter with updates and tips PLUS get instant access to my resource library with ALL of my Design Space files, cheat sheets and more! 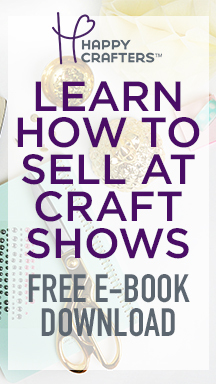 Want to save this Cricut Tutorial for later? Pin the image below!